Mobile phones in Croatia are very common and popular – you’ll often see locals with a mobile glued to their ear. A mobile phone in Croatia is called a “mobitel”. Read on for more details of mobile phone usage in Croatia, what you can do to save money when using your phone in the country, and details of telephone usage. The three mobile phone networks in Croatia are T-Com, VIP and Tele2. If you are bringing your handset from home, you will find it will hook up automatically to one of these. You also might find Tomato and BonBon, although both of these are owned by one of the main mobile companies, and not really separate networks in their own right. For travellers arriving from outside the EU, you would need to check with your home mobile provider as to what charges in EU will be. They may be able to provide you with a temporary ‘travel’ package for your plan. If you think you’ll be using your mobile phone a reasonable amount to either make phone calls within Croatia, or text and call home, as well as using data, you should consider purchasing a pre-paid SIM card. The three mobile network operators mentioned above all have details of these on the websites and you can buy SIMs at some newspaper kiosks and other stores. Make sure also that, if necessary, you call your home mobile phone operator before travelling to make sure that roaming is enabled. Alternatively, you may want to switch off data roaming if you have a smartphone (if you are coming from outside of the EU), so you don’t rack up crazy data charges. Should you wish to go ‘old school, public telephones or payphones appear pretty much everywhere. Buy a telephone card from a newspaper kiosk for easy use – these come in various denominations. The country access code for calling Croatia is 385. 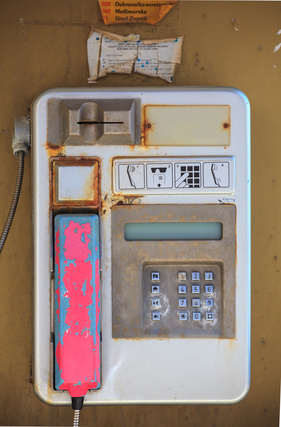 An old public payphone in Croatia – don’t worry, they don’t look like this anymore!